FBI Arrests 'Rocket-Builder' Former Boyfriend Of Woman Killed In California Explosion : The Two-Way He is suspected of possessing an unregistered destructive device, said the FBI, following an investigation into a blast on Tuesday which left Ildiko Krajnyak dead at the spa she owned. The home of Ildiko Krajnyak after it was searched by police on Wednesday night. She was killed in an explosion Tuesday at a spa she owned. 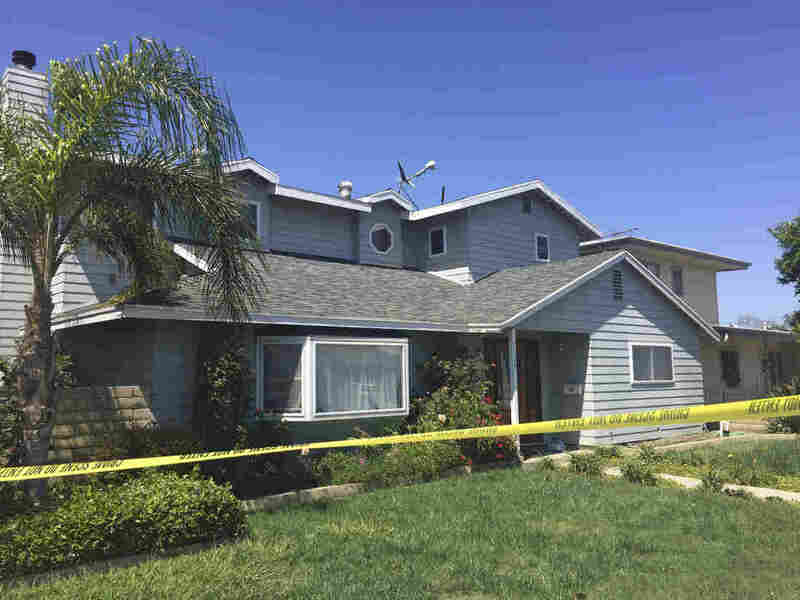 FBI officials say they expect to charge a 59-year-old California man with "possession of an unregistered destructive device" following an investigation into an explosion on Tuesday that killed a California spa owner. Officials were quick to add that Stephen Beal of Long Beach, is not being charged in connection with the deadly blast, but they said their investigation was continuing. FBI spokesperson Laura Eimiller told NPR that additional details will not be released until Beal is officially charged in a federal criminal complaint which could be filed as early as Thursday. #OCSDPIO @FBILosAngeles arrested Stephen Beal, 59, of Long Beach, on suspicion of being in possession of an unregistered destructive device. Mr. Beal is not being charged in connection with the Aliso Viejo explosion. OCSD continuing to investigate any connection. Tuesday afternoon's explosion in the small city of Aliso Viejo killed one person that law enforcement identified as Ildiko Krajnyak, the Hungarian owner of a day spa. Three other people were wounded and the spa's walls and entire bottom floor of the building were destroyed. According to media reports, Beal's neighbors say that Beal and Krajnyak had dated and that he had been an investor in her day spa. Facebook photos from Beal's account show they spent time traveling together, with a recent post on April 14 during a trip to Puerto Vallarta. Beal was known to be rocket-building hobbyist. "He used to make rockets that are about as big as I am," a neighbor told ABC 7. "He'd do it right here in the driveway by his garage and he would go out into the desert to fire them off." After the explosion, three search warrants were served – one at the spa business, called Magyar Kozmetika (which translates to "Hungarian Cosmetics"), one at Beal's home in Long Beach and one in Trabuco Canyon where Krajnyak lived. "We do not believe at this time that this was an accident," Don Barnes, Orange County Undersheriff, said after the blast. Items that may have been part of a bomb were sent to an FBI lab, according to the Associated Press. The Orange County Register reported that the night before the explosion, a sheriff's deputy had checked on the center where the spa operated and saw nothing suspicious. Authorities would not say if Krajnyak was targeted but one official told the AP that she was the intended recipient of what is said to have been a packaged device. Beal is expected to appear in U.S. District Court in Santa Ana Thursday afternoon. For now, Krajnyak's family is left dealing with her absence. A Gofundme account was set up to help bring her son home from college to attend her funeral. Her brother, Laszlo Krajnyak, wrote on Facebook: "With deep pain, my dear beloved sister, in tragic circumstances, went among the angels."